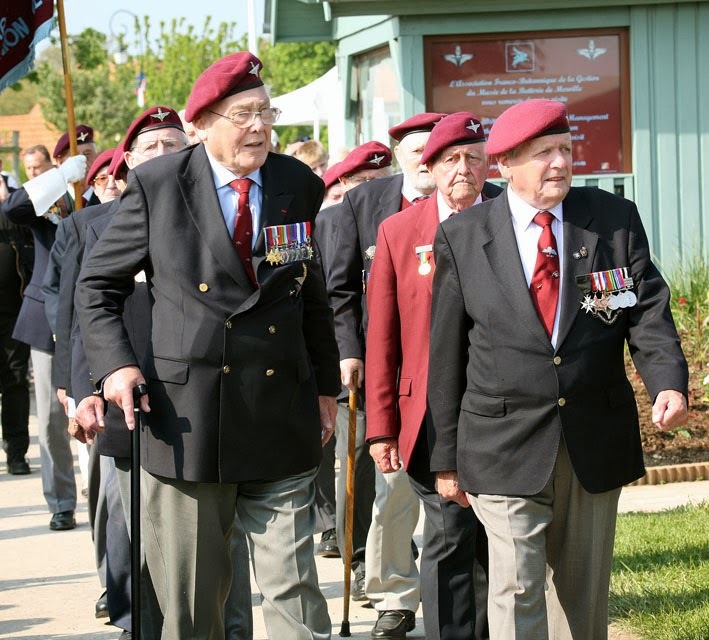 The 9th Battalion Veterans at Merville, 5 June 2013. 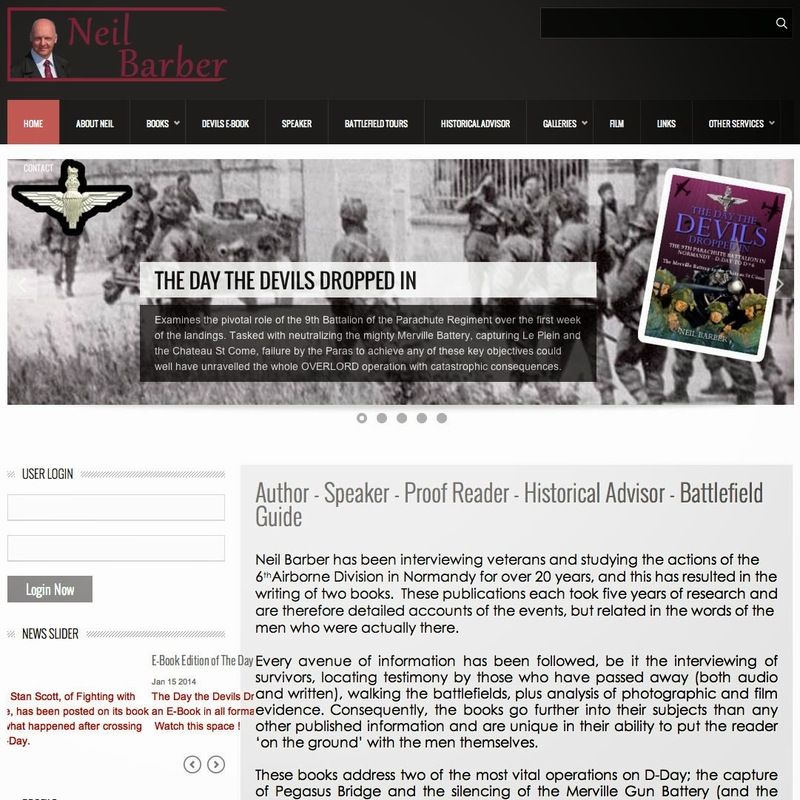 I have the privilege to welcome the blog's first special guest : Neil Barber, author of The Day The Devils Dropped In, an unmissable read for anyone interested in the assault on the Merville Battery in the first hours of D-Day and a precious source of information for the historical part of Wingwatch. The following chat is about how he became one of the most respected historians of WWII, his books, his visits to Normandy, the Veterans, the significance of the D-Day 70th anniversary celebrations, and much more. In other words : one more unmissable read. 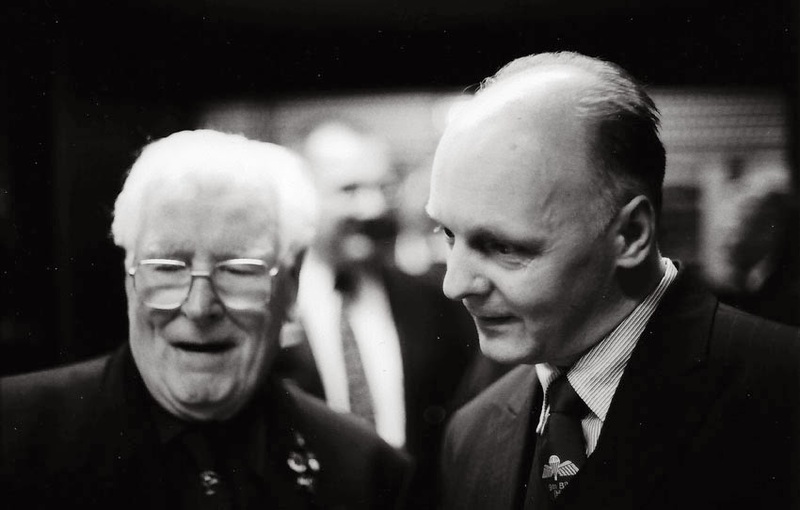 The first of some pictures featuring Neil Barber with Veterans involved in the Normandy battle: this one is Harry Gray. Who is Neil Barber when he is not writing historical books ? I am a mechanical engineer by trade, having served a four-year apprenticeship within the Ministry of Defence many moons ago. After 35 years service, I left in 2011 when they just cut the whole department ! No thought, no financial calculation, just cut. It’s scandalous (and tragic) what successive, clueless Governments in Britain have done to the MoD, but that’s another story ! When did your interest in the Second World War begin ? At a pretty young age, initially due to television programmes such as All Our Yesterdays, Winston Churchill, and Dad’s Army ! Into my early teens it was films like The Battle of Britain, The Longest Day, The Great Escape, The Dambusters and Colditz to name just a few. The other big influence was my uncle, Jeff Haward. He had served with the 1/7th Middlesex through France in 1940 and was evacuated from the Dunkirk beaches, to subsequently fight at El Alamein, Sicily, Normandy and Northwest Europe, and be awarded the Military Medal for an action in the Reichswald. At school, aged 14, I did not choose History as an option because I didn't think I could make a living out of it (which was probably not a bad decision !). However, my interest continued unabated, mainly reading books on all aspects of the Second World War, while also developing a greater interest in the First World War. Naturally, as one reads more (and get older) you begin to gain a deeper understanding of the hardships of living through a war and therefore it increases the appreciation of what those generations suffered and achieved. And throughout Britain’s modern history, there has never been such a pivotal point as the Second World War. Never has a war had such a powerful justification for being fought. Following Dunkirk, the country was literally on its knees, a hairsbreadth away from defeat. Consequently, it dawned on me that how could I live in such a country, surrounded by these very people, and not know about this vital time in history ? It became a fascination to learn about these men and women who endured and eventually won the war. And that has not changed in any way. I suppose the big turning point for me with regard to actively doing something was in 1984. I was given a novel called Covenant with Death, which although fiction, was based on the story of a ‘Pals Battalion’ on the first day of the Battle of the Somme, 1st July 1916. This was ironic because I never read fiction and can’t recall why I read this ! However, it was an excellent book and propelled me into reading more about the Somme. The following year, I began visiting the battlefields of the Western Front and ended up doing so for eight years. Like many people, I would do my ‘homework’ by reading personal accounts, war diaries etc, before visiting the specific areas armed with trench maps. Apart from the taking of photos, the only result of this was personal satisfaction. It was a very rewarding experience. However, I now realize that it was my apprenticeship, as it gave me a yearning for detail. How and why did you become involved in research about D-Day, British Paras and Merville? In 1993, I ‘returned’ to the Second World War, and visited Normandy for the first time, starting off at Utah Beach and going right along the coast, ending up at a certain place called the Merville Battery. Little did I know that it would become such a special location to me. The following year I took my uncle to Normandy. Jeff took me to the Chateau St Come and explained how ferocious the fighting had been there. I had never heard of the place and so again, for my own curiosity I started to 'dig'. I quickly became aware that it was really a 9th Parachute Battalion battle and so began to ask one or two veterans about the action. The whole thing just snowballed from there, because to my amazement, not one of the men said, "Who the hell are you ?" From General to Brigadier to Private they were all extremely helpful. I therefore tried to leave no stone unturned and after five years of interviewing everyone I could and following every avenue of information, The Day the Devils Dropped In was published. Subsequently, having become very interested in the area and the actions of the 6th Airborne Division, I’ve spent the last 20 years studying the Division’s history in Normandy. After The Day the Devils Dropped In the natural progression was to try and apply the same process to the Coup de Main operation. 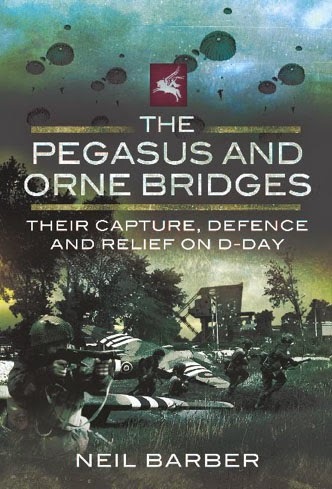 And so again, after another five years of research, The Pegasus and Orne Bridges (Their Capture, Defence and Relief on D-Day) was published. 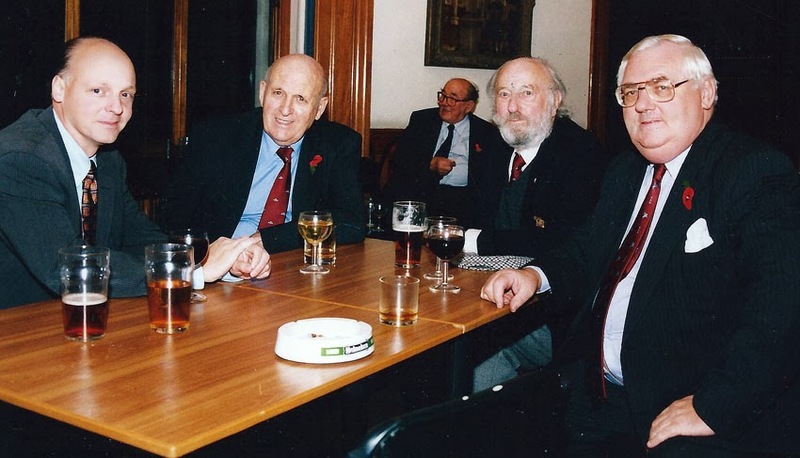 The two other books I have been involved with are biographies, having met these men while carrying out the research. 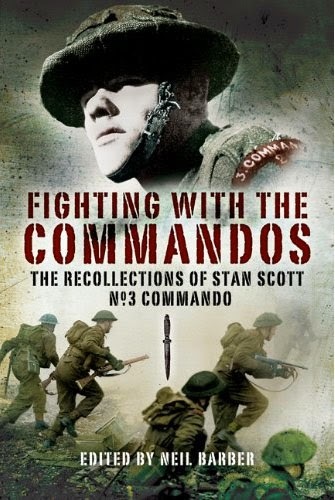 The books are Fighting with the Commandos, about Stan Scott of No 3 Commando, and Parachute Doctor on David Tibbs who served with 225 Field (Parachute) Ambulance and the 13th Parachute Battalion. Having interviewed so many Veterans, can you say they definitely have something deeper in common than training and fighting together? There is something deeper, a common bond, but that was gained through initially the training, the pride in gaining and wearing the red beret and most significantly the fighting. That bond of shared experience appears to get stronger as more and more of them sadly pass away. Are there episodes involving the The Day The Devils Dropped In project you remember fondly for whatever reason but you could not put in the book because they are not relevant to the readers? No episode immediately springs to mind, but I do remember feeling a little frustrated that due to the time period I was researching, I couldn’t mention General Sir Napier Crookenden within the text. He was extremely helpful. 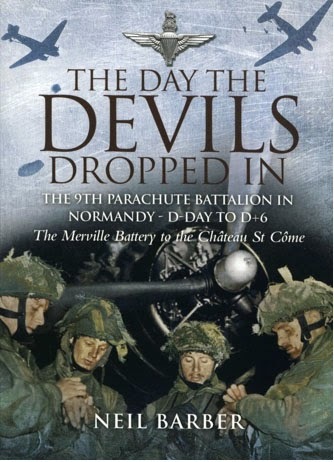 Many years ago he had written the privately published ‘The 9th Parachute Battalion – The First Six Days’ even though he did not take over command of the Battalion until much later. He allowed me to see and use the actual accounts that formed this book. It’s hard to explain just how extraordinary this man was and the incredible life he lived. However, I do hope to include something of his assumption of command of the 9th Battalion in an updated book. What else should we expect from the new edition ? 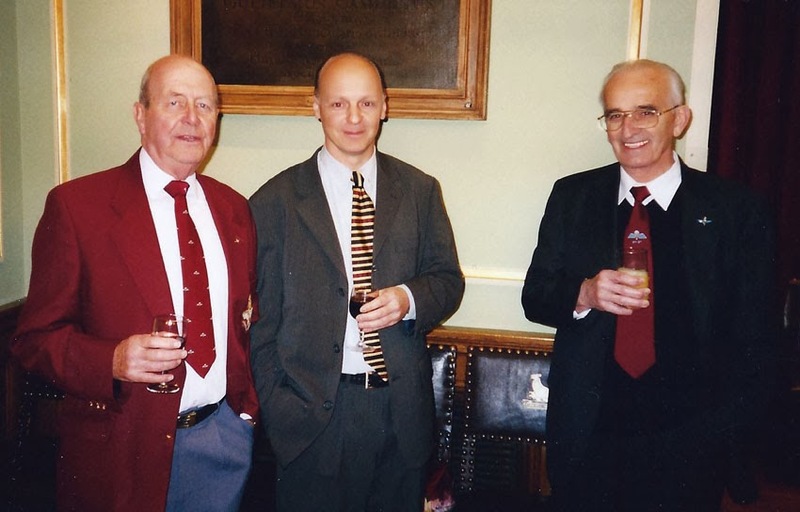 It has been twelve years since publication and so it produced a reaction whereby veterans of whom we did not know came forward and contributed further information and interviews. Also, family members have since volunteered a lot of information. A few vital documents have also been released into the public domain and analysis and interpretation of these has proven vital in understanding more about the drop on D-Day itself and therefore the number of missing, flight paths, all sorts of useful routes of investigation to follow. There will also be further photos of the men and improved versions of others. However, this is at least three years from completion. I will be shortly releasing the existing book as an E-book in all electronic formats. The differences between this and the paperback are that the photos are of much higher quality and I have included some improved versions. Also, the Appendix dealing with controversial issues at the Battery has been updated to where we are now and what we know. What do the visits to Normandy mean to you? And the next one in particular? 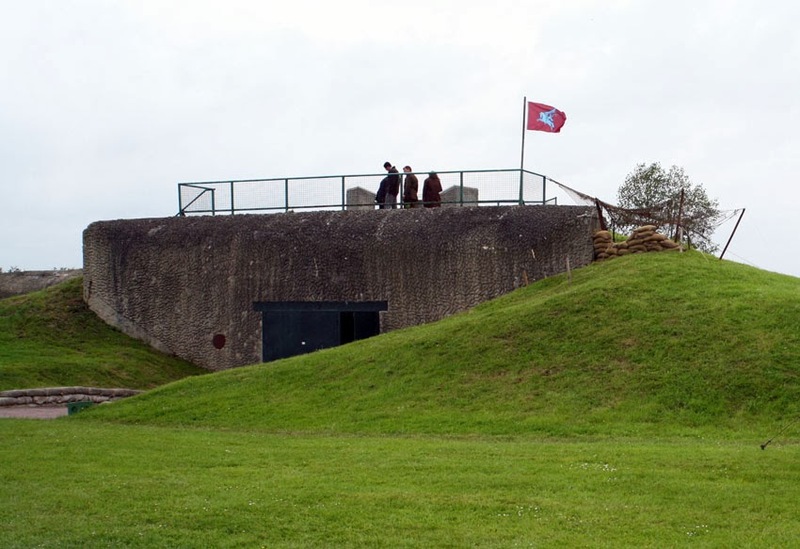 Being a member of the Merville Battery Committee, I visit Normandy quite a few times each year and the visits are always special. So much happened in that small area that the history just surrounds you. However, when the veterans are there it is even more memorable. It’s almost as if they bring the place and those days to life. This is good because although we know that it was a terrible time, it brings those that were killed to the forefront, if only for a few days. They are certainly not forgotten, but during these special days they are cherished. The importance of 2014 is that it is the last BIG commemoration when the veterans will be there in significant numbers. The ‘regulars’ will continue to go to Normandy until they pass away, but after that, it’s all downhill. I attended the 70th Anniversary of the Battle of the Somme in 1986, when there were quite a few veterans who attended, and I cannot believe that the time has passed so quickly and that we are now in the same situation. It’s an awful thought. How do you feel about the British sector being chosen as the main stage of the 70th anniversary? I think it is marvellous. The achievements of the British, Canadians, French, Poles, Belgians, Dutch and other Allied units are vastly underestimated in the Battle for Normandy. And so, it’s a great opportunity to show a world audience that their efforts and sacrifice were just as important as the achievements of the American Armies. In fact, without them, the US Forces would never have been in a position to break out of the bridgehead in the manner that they did. Is there a place you never fail to visit, apart from the most obvious ones (Merville, Ranville, Le Mesnil)? There is one special, unmarked location that I always visit. This is the country lane where Brigadier Hill’s party, which was on its way to find out how the Battery assault had gone, was bombed by ‘friendly’ aircraft. This has been another area were I have tried to ‘dig’ since the book came out, and now have far more detail as to exactly who was in this party and the aftermath. James Hill was almost God-like to the men of 3 Parachute Brigade. During pilgrimages in the 1990s and right up to his last trip (2004), whenever it became known that he was on the cross-channel boat, a buzz would go round the decks, an awe I had never experienced before. It was tangible. I was so honoured to meet him and very proud that he vetted and wrote the Foreword to The Day the Devils Dropped In. The last time I saw him was in 2004, after he had amazingly walked from the Ranville crossroads up to the cemetery. Afterwards, he was sitting in the hall across the road and I perked up the courage to go and say hello. We talked for a while and all the time he held my hand. He was obviously frustrated by his physical restrictions, but defiant. I had to hold back the tears. This man will always be an Airborne legend. How do you see the future when the Veterans are not with us any more and the public is left alone to celebrate their feats? Very sadly, as mentioned, it won’t be so far away when the veterans have gone. I believe that the attendance at the ceremonies will only get bigger. That has what has happened with the interest and commemorations of the First World War. 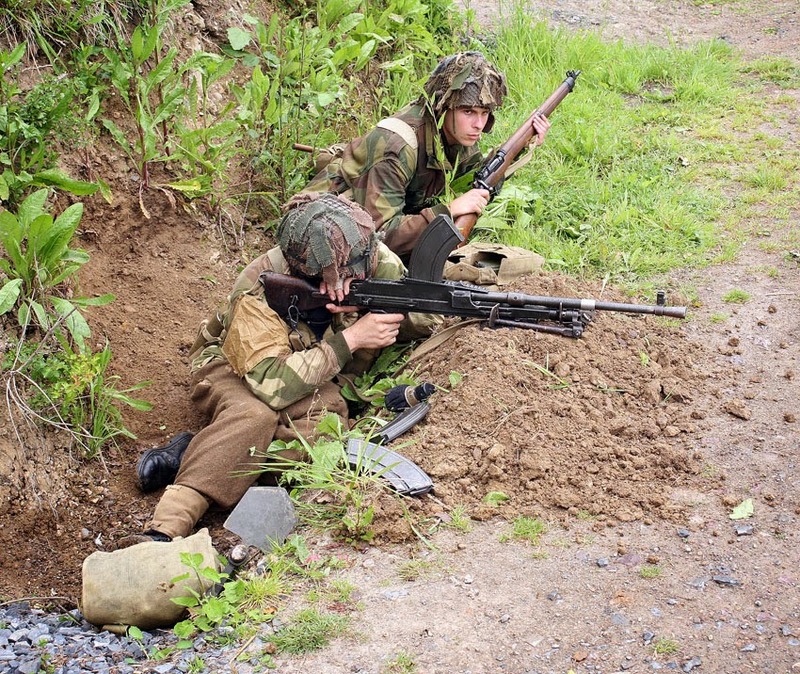 How do you feel about reenactments? I think that they will prove to be an increasingly important part of keeping the memory alive. However it is paramount that the reenactments are done in the right way and for the right reasons. Attention to detail is paramount. Is there anything more that should be done to promote remembrance, in Normandy as well as in the UK? I’m not sure what else can be done. The interest in the UK (from all ages) in the wartime 1940s period has increased dramatically over the past ten years, and the subject is on the school curriculum. One thing that definitely could be improved is the quality of documentaries made for television. Most of them just rehash old stories, some of which are wrong anyway. Detail is the answer to this. Producers seem to worry about keeping ‘the general public’ interested, but if they bothered to find out about the detail of certain things, they will usually find that the facts are far more interesting than fiction. Where can the readers find you on the web? I run a Facebook forum dedicated to The Day The Devils Dropped In.